The market for natural and organic cosmetics is at an all-time high and there is no end in sight. Quite the contrary: More and more consumers are purchasing and using natural and organic cosmetics, but the consumer demands are undergoing changes: Their focus is no longer solely on the ingredients, due to the growing awareness on the sourcing and environmental impact of cosmetics. Customers are looking to fulfill their skin care needs, but at the same time questioning the sustainability of cosmetic production, they expect alternatives to plastic packaging and they want to be certain that the global biodiversity is not endangered. “Authentic and innovative into the future“ is the motto of the Natural & Organic Cosmetics Conference held September 24 & 25, 2019. More than 250 executives from the entire cosmetics industry will focus on essential topics in presentations, panels and discussion groups. Many times, it’s the indie brands that are supplying the innovations customers are looking for – foremost attracting customers through online shops. Innovative products are in high demand, and E-commerce is booming as online players such as Amazon, Alibaba and Zalando are pushing into the beauty market. One of this year’s focal points of the Natural & Organic Cosmetics Conference will therefore be the development of beauty retail: in her keynote on the first conference day, futurologist Marta Kwiatkowski of the Gottlieb Duttweiler Institute will provide insights and outlooks about how this retail segment will evolve. Another expert presentation will focus on the question of how natural and organic cosmetic brands can benefit from global trends in online retail and social media channels. The conventional cosmetics industry has long since discovered the potential of natural and organic cosmetics. Now several FMCG companies are stirring up the market for green products. Key players such as L’Oréal, Unilever and Henkel are launching not only natureinspired lines, but certified organic cosmetics or are acquiring organic cosmetics companies. *“The pioneers of natural and organic cosmetics and traditional beauty brands are thereby closing ranks and are facing the same challenges of the future“,* states Wolf Lüdge, program chairman and manager of the naturkosmetik verlag, which in cooperation with the NürnbergMesse hosts the Natural & Organic Cosmetics Conference. *“Social transformation, the increasing demand for sustainability and the increasing activity of large corporations in the organic cosmetics market will turn the availability of raw materials into a pressing issue“,* explains Wolf Lüdge. Will raw materials be increasingly sourced from laboratories in the future? Will GMO and GMM not stop even at natural and organic cosmetics? The conference will therefore also discuss perspectives for the development of the natural raw materials market. • Organic cosmetics: maintaining 100% naturalness in the future? 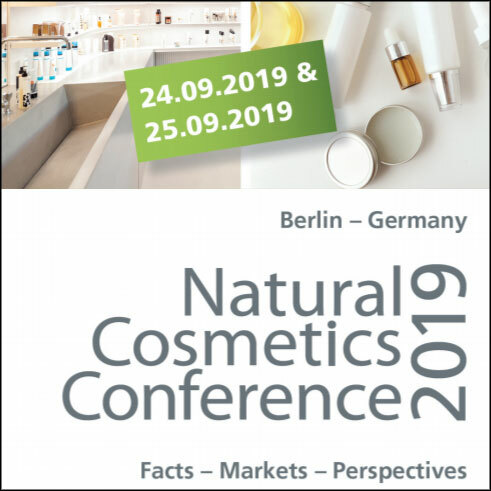 The next Natural & Organic Cosmetics Conference will be held September 24 & 25, 2019, in Berlin.